I've had the Chanel Pro Lumiere foundation for over a month now, and I thought it's about time I posted a review. I actually purchased this on a whim at the Malaysian airport, right before flying back to Melbourne. I was lucky the boyfriend wasn't there, because he knows the exact extent to which I am obsessed with makeup, and would have stopped me dead in my fairy-footed tracks to the duty-free stores. This foundation offers pretty good coverage. I normally don't wear concealer, so sometimes a couple of acne scars do show through and make me look kind of unkempt, but this foundation hides them adequately (not completely) so I look nice and polished. I apply this foundation with my Sigma F60 foundation brush, and not once has it turned streaky on me. I don't have to do much to avoid streakiness, which is a plus. The amount that one pump dispenses is perfect for the entire face. I find that the amount is more than enough for me to cover my face and neck, with a little left over on the brush for cleanup after my eye makeup. I have also heard that using a BeautyBlender in place of a foundation brush works wonders with this product, but as I don't own a BeautyBlender, I can't say. Wearing Chanel Pro Lumiere foundation - set with a very, very light dusting of Shu Uemura translucent pressed powder. Pro Lumiere is meant to give the illusion of an airbrushed finish, which I think it really does do! Chanel markets this foundation as having a semi-matte finish, but I really don't see it. It might be a little better with regards to oil control compared to the Vitalumiere and Vitalumiere Aqua, but the end result is a dewy, soft glow - nothing matte about it at all! In terms of oil control, I'd say that this foundation doesn't really help those with oily skin - if you have really oily skin its best to try another foundation like the Mat Lumiere, for example. If you're really keen on this type of finish then I highly suggest using a mattifying primer before applying the foundation, or setting this with powder. I do find that once I powder this foundation, the finish becomes a lot more matte than say, the Giorgio Armani Luminous Silk foundation, which I like, because what's the point of having two foundations that perform the exact same function, right? Another thing that I adore about the finish of this foundation is that it will not sink into the fine lines of your face! I don't really have fine lines (and I really hope it stays this way, with a little effort on my part, hopefully!) 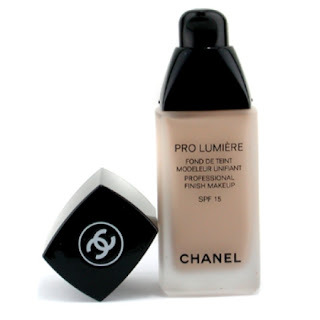 but I did test this and all the other Chanel foundations, plus a few foundations of my own, on the back of my hand. This one by far produced the best result - instead of sinking into the fine lines, it disguised them! I highly recommend this foundation to anyone whose concern is masking fine lines, although there is the Chanel Lift Lumiere targeted at older women, that might be more suited to those who have more major fine line concerns. Lee Hyori's Chocolate Smoky Eye - set with a decent dusting of translucent powder - this shows the more matte finish the Pro Lumiere is able to provide. My Night Out FOTD - without loose powder. I don't think Chanel caters to many shades with their foundation - I am wearing #20 Clair but the lightest shade matched me just fine as well, which means that it would be pretty difficult to match a really fair person. The same goes with darker skinned girls as well. Let me preface this by letting Malaysians know - the Chanel foundations are not cheaper at duty-free. They are priced exactly the same throughout Malaysia, so don't worry about getting a raw deal. I purchased mine for RM 165, if I'm not mistaken. Would I buy this foundation again? Hell, yeah! I would also love to try out the Mat Lumiere, but that's a whole different story altogether. It's a little steep, but for the effect (and, I must admit, the placebo effect with the brand name being what it is), I would definitely buy it again. I just found out that the Pro Lumiere foundation is being discontinued, and replaced with a different foundation later in the year. If you're keen on this foundation, stock up before it disappears! Otherwise, let's hope the Pro Lumiere's foundation is one heck of a replacement! A couple of great alternatives to the Pro Lumiere foundation are the Bourjois Healthy Mix Foundation, and the Bobbi Brown Moisture Rich Foundation. I hope this helps anyone looking for a replacement for the Pro Lumiere foundation!